We accidentally got into seed collection this season. Which is probably what happened thousands of years ago so this is not new! I first decided to try it with some peas that were past freshness on the vine. 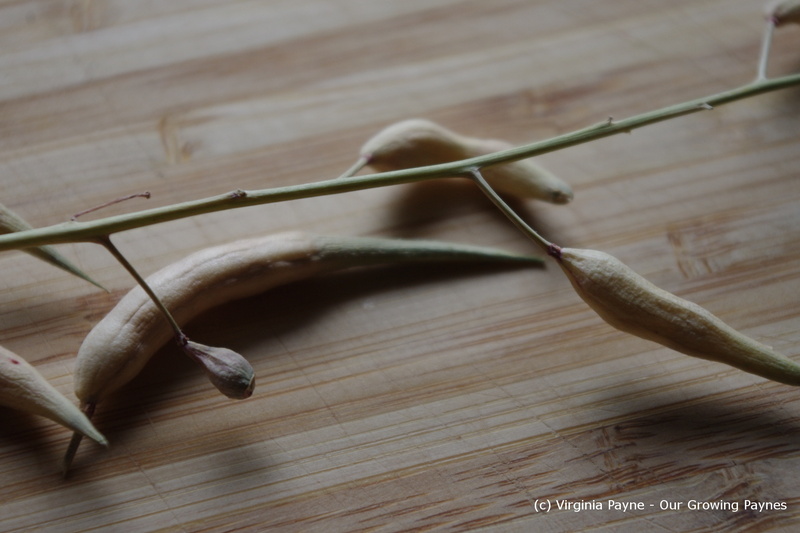 When I opened the dried pods I saw the seeds looked like the ones we bought. So I planted them in August and they are coming up just as well as the ones we already had. Sweet! Every year we plant the radishes alongside the carrots. We don’t eat a lot of them, just on salads but they are easy to grow. Well this summer some bolted quickly and got pretty tall. 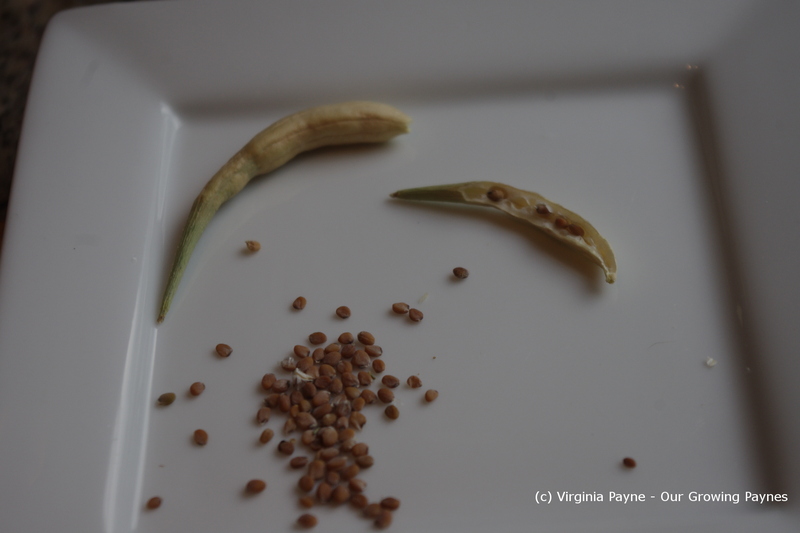 I saw they were developing pods so I opened on and saw the seeds. I took one radish and cut the pod bunch off to dry. They have been hanging round in the kitchen for a few weeks. So I decided it was time to collect the seeds. I wasn’t sure what to expect as I haven’t done this before but I was pleasantly surprised at how many seeds per pod there were. Not a bad return on investment! 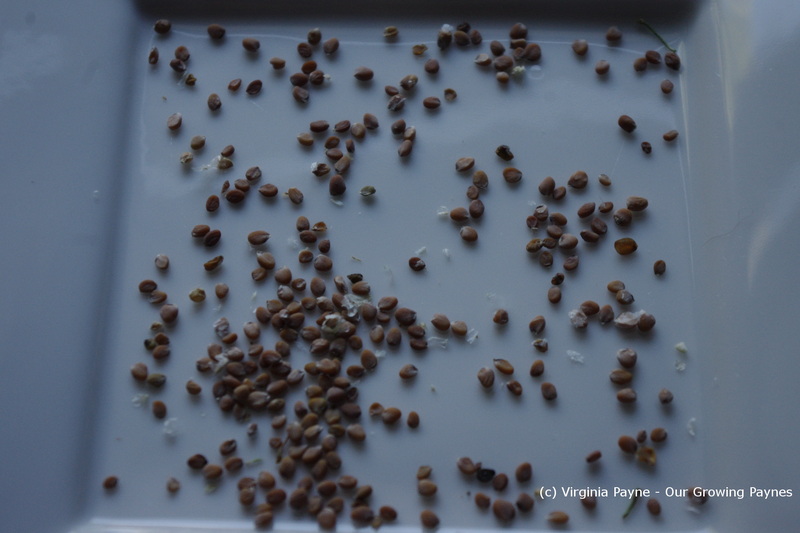 I read recently somewhere that you should store seeds in the fridge to simulate winter. I haven’t done this with any other seeds I’ve bought and then used for a few years so I wouldn’t mind some feedback on this. In the meantime I put these seeds in a little bag and put them in the fridge. I don’t see it would harm them. This entry was posted in Gardening and tagged food, gardening, harvest, kitchen gardens, plants, radish seeds, radishes, seed harvesting, seeds. Bookmark the permalink. Fingers crossed! Now we just have to wait for spring. LOL. It’s hard getting through winter if you love gardening! Wow. That is a lot of seeds for 1 plant! I know! I was really surprised. Would you like some for next year? We have plenty now.